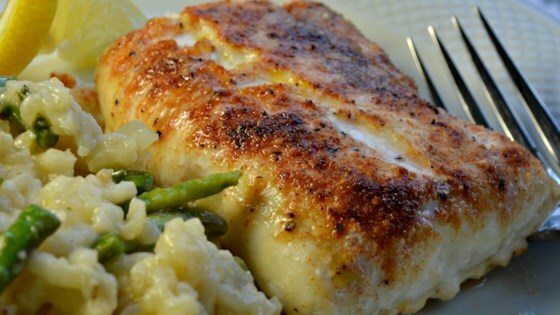 "Haddock is a wonderful light and flaky white fish abundantly available in New England. This recipe spices up its mild flavor and is very quick and easy to prepare." Set oven rack about 6 inches from the heat source and preheat the oven's broiler. Line a baking sheet with aluminum foil and spray with cooking spray. Arrange haddock fillets on the prepared baking sheet. Mix onion powder, paprika, garlic powder, salt, black pepper, and cayenne pepper in a small bowl; sprinkle seasoning over haddock. Dot haddock with pieces of butter. Broil in the preheated oven until fish is easily flaked with a fork, 6 to 8 minutes. Serve with lemon wedges. This recipe is easy and the spice combo is tasty! I used olive oil to make it dairy free. Excellent recipe. Season the underside, for even more flavor! I would definitely do it again. I added a little celery salt. Unless you like it really hot I would cut it back to 1/8 tsp of the cayenne pepper but its definitely a keeper. This is simple and flavorful. We've made it at least a dozen times in our house.